Drum Truck features a floating axle that reduces the effort required to break over and balance the load. Industrial-strength, heavy-duty 1" structural pipe frame includes double-welded joints for strength. Can be stored standing upright. Not designed to handle overpack drums. The crane trucks device lets you apply the exact tension force needed for secure handling while reducing container damage. 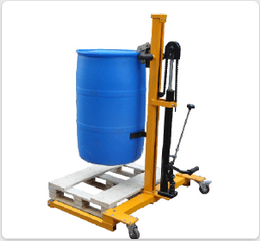 double-column frame drum truck with kick stand offers a sturdier alternative to single-column trucks.